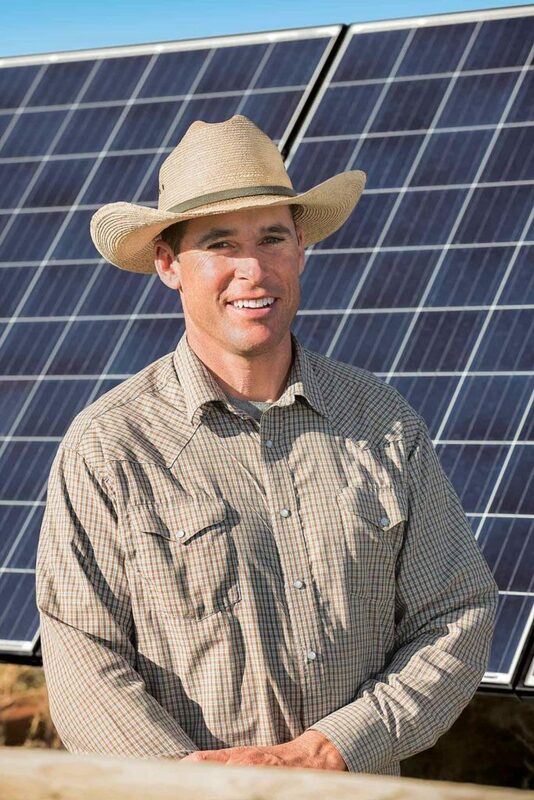 The opportunity for farmers and ranchers to tap into solar energy may be at its zenith. Solar panel costs have leveled off after taking a massive nosedive, efficiency has increased, and net metering policies have become more favorable. While solar power is still shining bright, it’s about to dim a bit, making 2018 the year to act for those considering the investment to offset energy needs. “The 30 percent federal subsidy for installing solar panels will start to stair step away after 2019,” warns John Hay, University of Nebraska energy Extension educator. “People who are interested in solar power need to take a serious look prior to 2019.” The 30 percent tax credit for residential installations will go away completely while the tax credit for businesses, such as farms and ranches, will gradually decrease to 10 percent. Recent dramatic drops in solar panel prices certainly will help mitigate these and other potentially negative policy changes going forward. “In the last 5 years we’ve seen modules [solar panels] go from as high as $5-$6 per watt down to $0.50 per watt. That drops an average panel from $1,000 each to around $150 each,” Hay says. A turnkey installation will run in the neighborhood of $2-$2.50 per watt. A home and shop, on average, can be run by a 6,000- to 10,000-watt system, he says, amounting to an investment totalling $15,000-$25,000. Hay notes the recent tariffs imposed on imported solar panels should have a negligible impact on overall cost. “Price is likely to only increase from around $0.60 per watt to $0.65 per watt for the solar panels themselves. It’s a little more expensive, but nowhere near the $5 per watt we were paying not that long ago. It’s still a great price,” Hay says. Alex Blake’s dedication to renewable energy goes beyond business. His off-grid home is powered by wind and sun. The larger impact is the loss of tax credits and potential future policy changes. Hay notes that while net metering policy has improved in almost all states, it’s not set in stone. Net energy metering comes into play when a solar power system is connected to the electric grid. When customers produce power in excess of their needs, it goes onto the grid and they are credited by their utility company for the energy produced. Power companies used to buy overrun energy for a greatly reduced rate, like $0.02 per kilowatt-hour (kWh), and then sell power back to producers at a full retail rate of $0.10 per kWh. Current net metering policies give solar producers full, or close to full, retail value for the power they produce. All but three states—South Dakota, Tennessee, and Alabama—have some form of net metering policy in place. Solar believers. Solar panels intersect nearly every line of sight at Blake Nursery and Blake Ranch north of Big Timber, Montana. 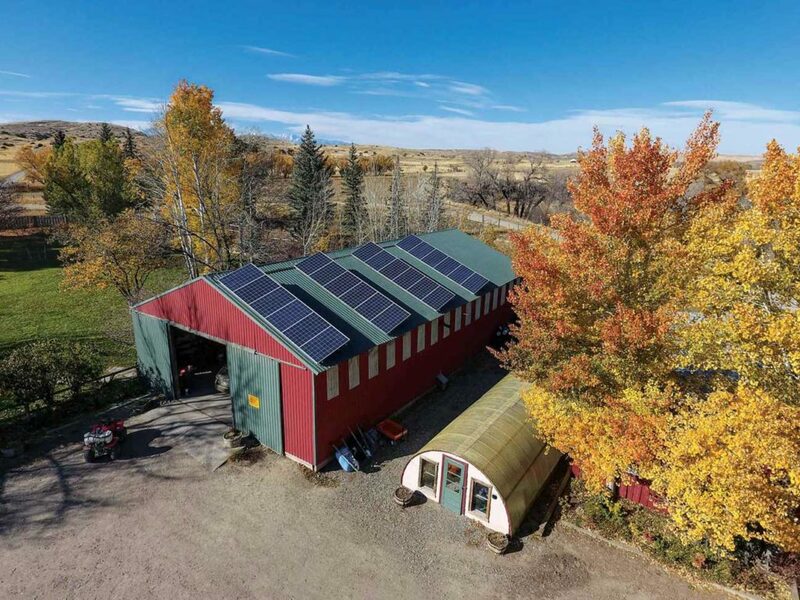 A 24-panel, 5,700-watt grid-tie solar array dominates the southeast slope of their farm shop, harvesting the often surprisingly intense mountain sunshine and channeling it to offset their ranch and plant nursery power needs. A grid-tied, 5,700-watt solar array offsets about 50% of the Blakes’ energy needs. With reduced energy cost, grants, tax breaks, and current net metering policies, the Blakes calculate the $21,000 installation will pay for itself in just 10 years. Hay notes most solar panels have 25-year warranties. Alex and his parents, Sandi and Francis Blake, are passionate about renewable energy and use solar power in a variety of capacities in their business endeavors. They situated a 1,600-watt solar array on a 1900s-era coal wagon for mobility. They move it with their 200-head cow/calf herd to provide power for their stock tank wells. The Blakes chuckle at the irony of the coal wagon being used to transport their modern solar array and the juxtaposition of new and old technology. 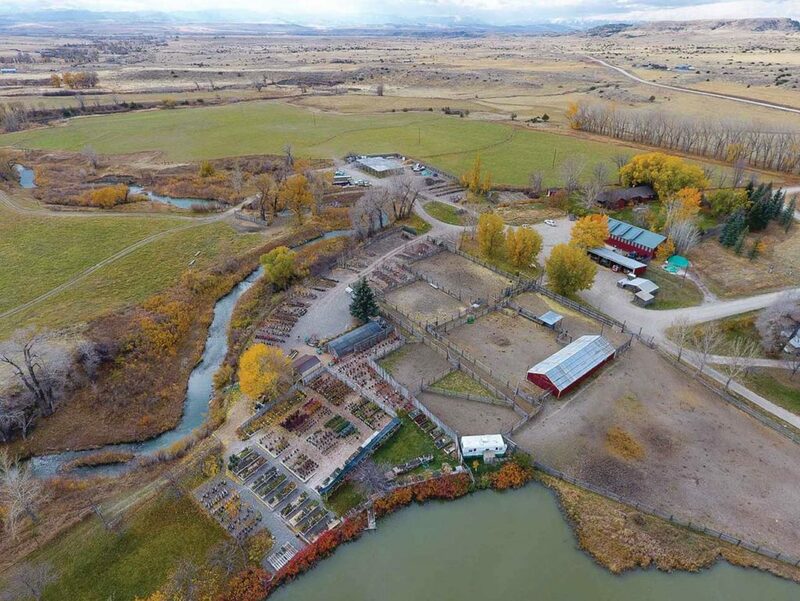 They have several small solar arrays permanently installed to run stock wells and power irrigation for their carefully curated offering of native or regionally hardy plants and trees at their 41-year-old nursery. Alex and his wife, Abby, live off grid using a 1,600-watt solar array and a micro wind turbine to fully power their home. “It was going to cost $20,000 to get electricity run to the house. Instead, I purchased a used solar power system for less than $5,000,” he says. A bank of batteries—charged by a newly upgraded array—stores power for when the sun isn’t shining. Blake Nursery runs on sun. Their next target for solar power is a new irrigation pivot. Hay says those with predictable, stable year-round monthly power needs are most likely to benefit due to seasonally fluctuating energy prices. Steady use. Hay gives the example of an Ohio swine finishing barn with constant energy needs. A 40,000-watt system installed at $2 per watt cost them $80,000. A $24,000 federal tax credit brought costs down to $56,000. The system generates 48,500 kWh per year with the average electricity price being $0.11 per kWh. This offsets about 75 percent of the barn’s electricity needs. They expect to recoup their investment in 9-11 years. Connecting to the grid is also critical for the highest return on investment, Hay says. He explains freestanding units have all the same input costs plus the need for expensive battery systems to store energy for times of lower production. “You’re entirely dependent on the solar panels so it’s critical to size it properly, including accounting for a string of cloudy days. It becomes economically challenging,” he says. Hooking into the grid gives people the power to choose the size of the investment they want to make and offset as much or as little of their energy costs as they are comfortable doing. A great place to start is the database of state renewable energy resources found at dsireUSA.org.